Michaela is a certified yoga instructor who has been teaching for 7 years. Michaela teachers vinyasa, yin and restorative yoga. She loves creative slow flow, alignment focused vinyasa yoga and the renewing qualities of yin and restorative yoga. She earned her degree in Nutrition and Dietetics from Bastyr University in June 2016 and currently works with the Forest Ridge School of the Sacred Heart as the Resident House Chef for their international boarding students. Camille Dodson is a certified yoga instructor with 5 years of experience teaching yoga. Camille earned her masters degree in International Child Studies and is currently working as an assistant teacher at a Montessori School in Seattle. 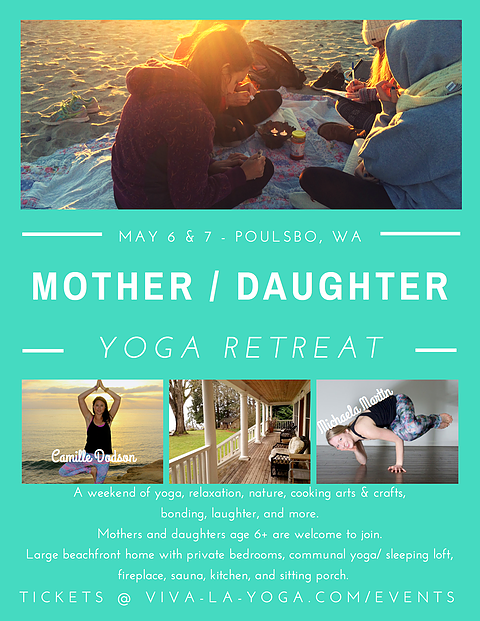 So excited to announce my first ever mother/daughter yoga retreat! We'll head over to our beautiful home on the Hood River Canal in Poulsbo, WA on May 6th and 7th. Plan to arrive at 1 pm on the 6th and we'll depart at 10:30 am on the 7th. Our weekend will include yoga, arts & crafts, time in nature, and the opportunity for mothers and daughters to get away from their usual routines and bond over shared interests. Our home has 5 bedrooms, a communal sleeping/yoga loft, beach access, a fireplace, sauna, large wrap-around porch, and incredible mountain views. A light lunch will be served upon arrival Saturday afternoon. Dinner will include a cooking class lead by myself! We will make the main course together but please bring a side to share. Breakfast will be provided Sunday morning. Bedrooms will be on a first come, first serve basis. Additional guests will sleep in the large sleeping loft and are asked to provide their own air mattress/sleeping bag.